The Catechism “Christ – our Pascha” is the official text of doctrine of Ukrainian Greek-Catholic Church. The book reveals the characteristic of theological tradition of the Church, based on Scripture, the heritage of Church Fathers and pastors the UGCC, decisions of the Ecumenical and Local Councils, liturgical writings, etc.. The official presentation of the Catechism was held in Lviv Holy Spirit Seminary on June 24, 2011. 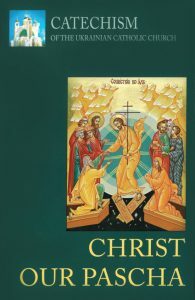 English edition of the Catechism of the Ukrainian Catholic Church: Christ- Our Pascha was published in 2016. Every effort has been made to retain as nearly as possible the precise phrasing of the original Ukrainian language second edition. One notable exception involves the name of our Church. Rather than calling it the “Ukrainian Greek-Catholic Church,” most of the faithful of the English-speaking world use the term “Ukrainian Catholic Church,” and it is rendered this way throughout the Catechism except in cases where there is a reference to a particular institution or body of the Ukrainian Greek-Catholic Church.